Jarrett Bay Boatworks are one of the most well-respected custom sport fishing boat builders in the world with over 90 deliveries. 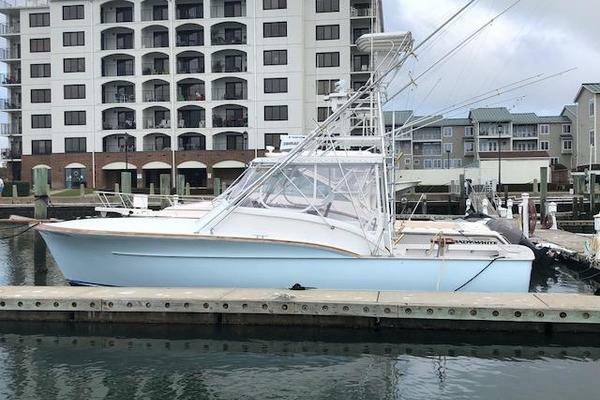 Let the expert team at United Yacht Sales help you find the right pre-owned Jarrett Bay Custom Boat on the market today that meets your budget and needs. Built with integrity and efficiency, Jarrett Bay Yachts have been on boat buyers’ radars ever since 1986. This premier builder of custom boats began when Randy Ramsey led the construction of Sensation – a 52’ charter boat he built in his own rustic shed. Overtime, Jarrett Bay has gained recognition by building and delivering over 90 sportfish boats and providing maintenance like marine services, paint expertise, hurricane haul outs, and inboard and outboard services. Since those early days, Ramsey has continued to push himself in creating and building the perfect boat for himself and his family of Jarrett Bay owners. His unrelenting pursuit in his creations has made the Jarrett Bay name an established one by delivering the most confidence-inspiring offshore rides in the business. The engineering and workmanship that goes into Jarrett Bay is not only high quality but also, in a sense, “rugged”; all equipped with a tough hull and stiff, lightweight structures that stands up to high-performance running for the long haul. Jarrett Bay’s harmonious balance of all elements is what makes a Jarrett Bay the most solid seaworthy boat you can own. The shapes on the running surface, sharing of displacement, perfect weight ration, and low center of gravity are just a couple of elements that make these yachts top quality. Regardless of the large size models or status of the sea, a Jarrett Bay boat never feels skittish – their attention to water flow allows those larger designs to optimize for high speeds, ensuring easy handling. Craftsmen have been building these models for years and naturally, their attention to details started with their desire to build the world’s finest sport fishing yacht. Focusing on the solutions and having a depth of resources and experience provides problem-solving skills that all Jarrett Bay builders possess. Their attention to creating a positive ownership experience is a big reason why owners not only buy one boat from Jarrett Bay, but also create a loyal relationship. 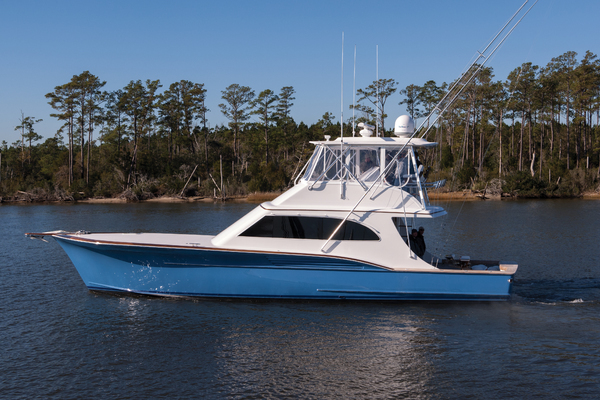 The 77’ Jarrett Bay stays true to its custom Carolina heritage, yet still pushes the limits when representing the next evolution in sportfish performance and functionality. Her cold-molded fir and Okume bones are just a couple of small details that continue to impress those boat buyers who are looking for intelligent designs and efficient constructions. Her prop tunnels allow increased speed, while also provides a noteworthy draft of less than six feet. Sporting a 21-foot, 6-inch beam, this model offers plenty of room to create spacious layouts and well-appointed amenities aboard this fisherman’s dream of a vessel. Her sizeable salon is well equipped with wide couches that are sleep worthy and spacious. The galley, which comes with, an overabundance of storage space shows off more of the 77’s attention to detail – fully stocked with top-of-the-line appliances. Featuring a five-stateroom, six-head layout, below deck provides great comfort, including a master, VIP, guest’s quarters, and captain/crew space. Above deck, you can find the cockpit with plenty of in-sole boxes, extra storage and freezers, as well as the mezzanine couches – a perfect setting for a fisherman’s dream that also wish to enjoy their time on water. Quick out of the hole, her performance is very pleasant and includes an engine room that is very quiet. This boat is not only built for those who appreciate taste, but also for those who appreciate high performance and resistance. Built with the Carolina flare in mind, the 46’ Grander is a “truly custom” boat that features bold choices, including dark paint and black tower hardware – truly standing from the rest of its fleet. Aggressively beautiful, the 46 Grander possesses the quintessential Jarrett Bay characteristics that are powerful, while being extremely eye-catching. On the bow, you can find built-in bucket chairs, drink holders, live wells, pop-up cleats and rod holders – a popular place for guests to kick back and enjoy the ride. Below deck you can find a sense of resourcefulness throughout the fisherman-friendly cabin. Through the sliding door you will find a V-berth, tons of well-organized rod and tackle stowage and a well designed galley suitable for any fishing trip. It even uses its stairs from the cockpit to the bridge and above the mezzanine seating for extra stowage. Its walk around design creates a functional atmosphere – a perfect platform for those chasing any target species. The tower above offers the captain perfect visibility on those rougher days, while still being comfortable. Not only does this vessel truly excel in fisherman qualities, but also provides a smooth ride for any boat goer while cruising at 30 knots. One stands out with amazing quality and technique and the 38 Express is no stranger to those traits. Influenced by the tradition of boatbuilding in the Outer Banks of North Carolina, this model offers a serious ride for those wanting a little more adventure. Her clean lines and lightweight structure provide a smooth and clean experience. The hull design allows her bow to have Carolina flare and finish into transom corners with a generous radius. You can access the lower accommodations through the centerline, which is tastefully accented with satin-finished teak and sole carpet. A small galley and sink are included along with a seating area and V-berths forward, making it the perfect relaxing area for a fishermen getaway. True to its custom roots, her hull is laminated with three layers of fir and mahogany creating a hull shell supported with marine plywood bulkheads and web frames. Not only does her cold-molded constructions offer a sturdy superstructure, but also proves to customers that these boat builders know how to customize a boat. Smaller, but serious – the 38 Express won’t disappoint those looking to have a perfectly crafted fishing boat.